After a very dry June and July our vines were in need of a good rain. An inch or two would have been great, but in just a few hours on August 11 we received 3.5 inches. This ended the drought and refreshed our stressed young vines. But that quantity of water was more than some vines could handle. They pumped the water right into the grapes which lead to berry swelling and in a few cases, berry cracking. If you are a tomato grower you understand the phenomena. Fortunately we have not had any significant rain since, but those few short hours shifted the way we are now looking at the vintage and harvest. 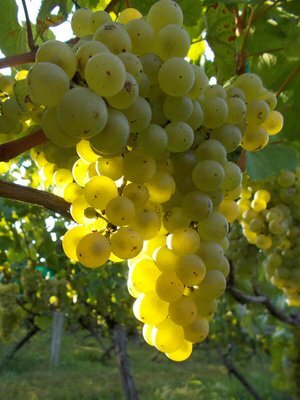 The whites are a bit fragile as the clusters are more compact and will be more likely to rot if we have any prolonged rains. Yesterday we took our first berry samples. Shari squeezed out some juice and then ran lab analysis (sugar, pH, and acidity). We then tasted the juice. The lab numbers are indicating that harvest could start next week, but the flavor development and intensity are lagging behind. We need cool, crisp nights to slow physiological ripening and let the flavors and aromas catch up. The reds won’t be under scrutiny until later in September. So that’s not our immediate concern. Because of this early harvest scenario, my best guess is that is could be a better red vintage than white. In any case we are all looking forward to the weather shift starting tomorrow when autumn’s first tease pushes through from the north. Thank you Canada! Only someone who is well-prepared has the opportunity to improvise. The seemingly undistinguished ridge behind the winery is starting its metamorphosis into a vineyard. In July the soil was very dry. Conditions were perfect for a deep ripping of the soil. The tractor pulls a long shank (see photo) to a depth of about 18 inches. This breaks up the soil and rocks (of which there are many) so that when we plant next spring the young vine roots will easily find passage deep into the subsoil.